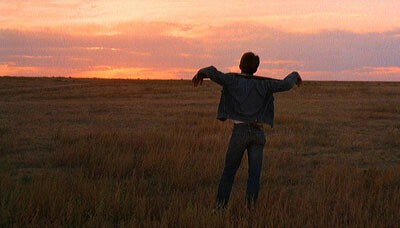 “Badlands” just proved the impossible to me: an epic story can be told in under two hours. In fact, all you really need is 90 minutes. It may just be that Terrence Malick is one of the best, and definitely the briefest, epic storyteller. “Badlands” is a story that’s been done time and time again. Yet, Malick takes it and tells it in the most gripping, original way possible. “Badlands” begins in a quaint South Dakota suburb. It’s told from the point of view of Holly (Sissy Spacek), a bored fifteen-year-old with an overbearing and abusive father. She forms a relationship with Kit (Martin Sheen), a rebellious garbageman with the look and attitude of James Dean. Kit “saves” Holly from her sheltered life and they live a slightly nomadic life on the road. They leave a bloody trail up to the Badlands of South Dakota. “Badlands” came out just six years after the revolutionary “Bonnie & Clyde.” I bring this up simply because the story of Kit and Holly nearly matches the story of Bonnie and Clyde. Though in a way, “Badlands” might just be a better movie because their escape feels so much more painstakingly built up to. Not to mention, their crimes are even more inexplicable and therefore even more horrifying. The greatness of “Badlands” can be attributed to the culmination of so many different things. It is not merely an achievement in one field. First off, there’s the fine performance by the then unknown, but now legendary stars. Sheen so perfectly emulates James Dean, the one man his character constantly seems to try to emulate. Spacek meanwhile, is so convincing in her innocence that even after all Holly has been through, we realize she is nothing more than a confused and misguided teenager. 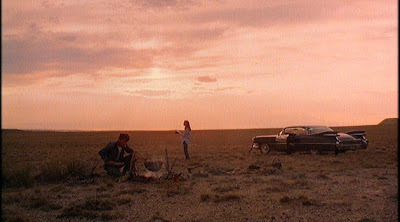 Despite the fact that nearly everything in the movie achieves for the satisfying whole, “Badlands” is overall a triumph in cinematography and directing. The images at times feel less like film and more like still photos. They are jaw dropping in their scope. It’s amazing how the film is able to turn nature into a living, changing character. We get to see the sky turn from day to dusk to light. Of course, not of that would be possible without Malick. Malick is a known recluse who only directs a film every 20 years or so. That’s a shame. He has created possibly one of the most beautifully shot films I’ve ever seen. It’s not just what’s in the images, but how much detail is put in every shot that astonishes me so much. Sometimes, it seems like nature is more important to Malick than the actual story. Look closely at how Malick makes the tall, brown grass looks golden. And watch how the gold contrasts to the lush green right behind it. Look at other times how the characters are framed against the ever expanding desert, or the gorgeous sun at dusk. These are our characters: as wild and curious as the world that surrounds them. Nature is our characters. Our characters are nature. It’s not just the fact that the images are beautifully shot, but that they feel so real. Everything about “Badlands” just feels absolutely organic. What I feel is so impressive about Malick’s direction is not just the images he shows, but how he strings all of that together into a story. Some films linger on their beautiful images and forget to tell their stories. Malick doesn’t forget his. He manages to both tell a compelling story and take extended breaks to admire the scenery without running on forever. It’s epic filmmaking without an annoyingly long epic running time. I’d also like to add that the film’s climax includes one of the best chase scenes never talked about in cinema. It’s eerily personal, and so effective in how it manages to create sympathy for a character who really doesn’t deserve it. “Badlands” has an influence that extends well into today’s world of film. I can see its visual influence in filmmakers like the Coen Brothers, Sam Mendes, and Gus Van Sant. It has imagery that will forever haunt and stun me. The story of Kit and Holly being blinded by false ideas of freedom and rebellion is like the ultimate American ballad. And Mallick is not just its auteur, but its poet. This entry was posted in Badlands, Epic, Martin Sheen, Movie Review, Sissy Spacek, Terrence Malick on March 18, 2010 by ian0592.